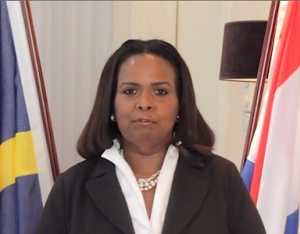 THE HAGUE, WILLEMSTAD – Persbureau Curacao reports that Minister Plenipotentiary, Marvelyne Wiels gets nearly 6,000 guilders (3,400 dollars) per month for living allowance, as long as her official residence is remodeled and cannot be used. The renovation of her official residence is currently on hold, after the contractor withdrew. He says that he will not accept any changes Wiels wants to make, without first being paid. Wiels has been living, since taking office in July last year, in her own home in Rhoon, the Netherlands.